I really love sweets. Well, and salty foods too, actually. What the heck, full disclosure I love eating. Still, despite the fact that my body constantly thinks it’s in full starvation a la “Naked & Afraid” survival mode, I try to make sure what I consume is going to be fuel for my body. Smoothies are my main goto; I feel like green smoothies are my major food group, like smoothie: it’s what’s for breakfast. And lunch. And probably dinner. * Variation: add organic, GMO free peanut butter powder for a extra delicious treat. You can also add a banana. 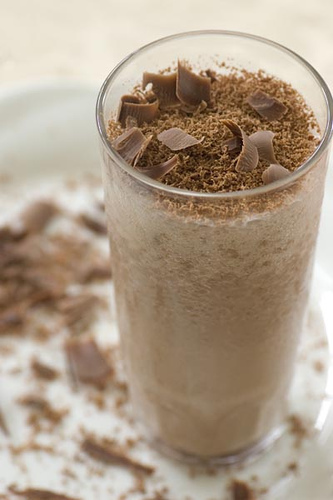 Or, throw some raspberries in for a choco-raspberry shake! Put all together in your blender and blend away to the consistency you want. More ice will make it thicker and more like a Frosty. The positives: it’s very low cal, vegan, sugar free (depending on the protein powder you use) and a good alternative to icecream. The cons: let’s be real, if you are used to eating a lot of processed, sugary foods, it really won’t be a perfect alternative to chocolate ice cream or Frosty, and I’m not even going to pretend it will be. It’s a great alternative though, and it might do the trick in helping you ween yourself off of those foods or help keep you away from them. I personally thought it was kinda magical. Give it a try and let me know what you think and if you have any ingredients you think make it taste even better!